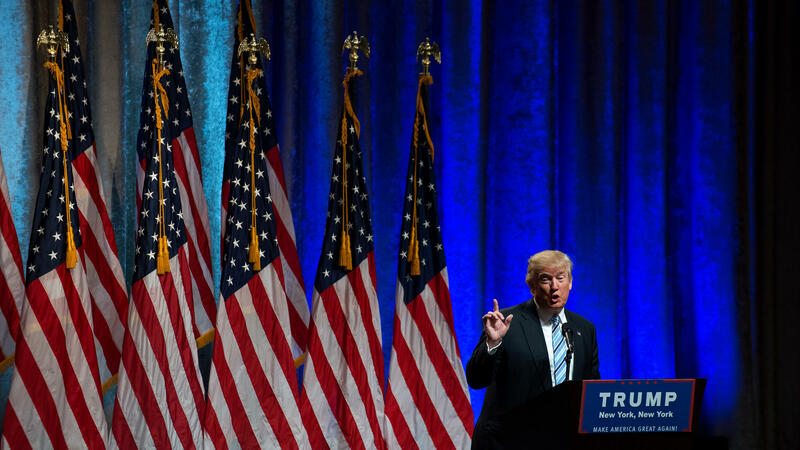 Republican presidential candidate Donald Trump speaks July 16 in New York City. The president-elect's Twitter habit could run up against cybersecurity recommendations once he's in office — but he may also choose to disregard that advice to keep his direct channel to the public open. Since winning this year's presidential election, Donald Trump has given the American public no shortage of outbursts, public disputes and grandiose declarations on Twitter. Just this week, he questioned the veracity of CIA reports alleging Russian influence and hacking with the goal of helping Trump win the presidency. He has picked fights with The New York Times, CNN, Saturday Night Live, and Americans who would burn the American flag. Trump has called the Air Force One program too expensive, questioned America's China policy, and made allegations of widespread voter fraud (with no evidence supporting the claim). He also has bragged about making business deals with the likes of Lincoln, Carrier and a Japanese mogul. Trump claims these will save or create tens of thousands of jobs, though as more details emerge, the deals seem a lot less advantageous for American workers than the president-elect initially implied. All this has been done from Trump's Twitter account. Throughout the tweets, one thing has become clear: Donald Trump has become even more emboldened in his use of the social media platform since defeating Hillary Clinton. Trump seems to be uniquely adept at using Twitter to control a news cycle, bypass traditional press and capture the country's attention. But as his inauguration draws closer, a new question emerges: What, if anything, might make Donald Trump change his Twitter habits? The answer might be the presidency itself. Cybersecurity protocols for a presidential smartphone will mean Trump's official smartphone once he's in the White House will be a bare-bones, stripped-down, ultra-secure device. President Obama joked about just how basic such a device is during a summer appearance on NBC's Tonight Show. "It doesn't take pictures, you can't text," Obama told Jimmy Fallon. "The phone doesn't work. You can't play your music on it. So, basically, it's like — does your 3-year-old have one of those play phones?" Several cybersecurity experts told NPR that it's highly unlikely intelligence personnel will recommend use of the Twitter mobile app on Trump's government smartphone. "I don't think it'd be possible to do that on a secured phone, at least with the security policy that they had for Obama's phone," says Martin Alderson, co-founder of mobile security company Codified Security. "I think that the Twitter app would be too hard to lock down." That's especially true, he said, with Android phones, where gaps in mobile app security take longer to patch than on Apple devices. Alderson suggests Trump could start dictating tweets to a staffer once he's president. "I think usually what we'd probably see is perhaps an aide doing it for him on his behalf from a more secured laptop [or desktop] computer," Alderson says. This could mean that Trump might tweet less, and avoid tweeting early in the morning or late at night as he does now. Having a staffer serve as a filter for tweets could change the tone of what he's writing as well. But Trump also could choose to use his own device in addition to the official presidential smartphone, says Tom Pageler, a former Secret Service agent who's now chief risk and security officer at technology company Neustar. The National Security Agency, Secret Service and White House Communications Agency will advise the incoming president on suggested security measures, Pageler says, but ultimately, the president can make his own smartphone decisions. "Together they will advise the president of safety [protocols] that they should take, maybe disabling a GPS," Pageler says. "However, the president can do what they want. They're still a person. ... In this case he [President-elect Trump] definitely has the trump card." A representative from the Defense Information Systems Agency told NPR that until Trump is inaugurated, his transition team would handle questions related to his devices and social media use. Trump's transition team did not respond to NPR's requests for an interview on this topic. If historical precedent is any guide, we should expect Donald Trump to keep tweeting — presidents always look for ways to bypass traditional media. The White House Correspondents' Association has complained, for example, that President Obama's reliance on official White House photographer Pete Souza resulted in photojournalists being excluded from events involving the president. Trump's tweeting is just the latest example of that desire to control the message — and if it continues to work for him, why would he let it go? Donald Trump criticized reports that the CIA believes Russia was trying to influence the election through hacking. And as Trump so often does, he took his comments to Twitter. He tweeted this - unless you catch hackers in the act, it is very hard to determine who was doing the hacking. Why wasn't this brought up before election? How the president-elect uses Twitter and what happens once he's sworn in on this week's All Tech Considered. SIEGEL: Here in the studio I'm joined by NPR's Sam Sanders. Hi, Sam. SAM SANDERS, BYLINE: Hey, Robert. SIEGEL: And remind us - since there have been quite a few - of some of the tweet storms that Donald Trump has generated since the election. SANDERS: You mentioned the latest. This morning, Trump got into it with the CIA over their report that Russia interfered in the U.S. election to help Trump win. He said that you can't figure out a hack unless you catch it in the act, but experts tell me that it's a lot more complicated than that and that hackers do leave evidence behind. Today, Trump also critiqued the F-35 program and said it's too expensive. Previously, Trump has gotten into Twitter fights with the cast of "Hamilton," The New York Times, "Saturday Night Live." And keep in mind, a lot of these allegations and tweets are exaggerated or very misleading. Trump recently also tweeted that people who burn the American flag should lose their citizenship or go to jail. SIEGEL: Which the Supreme Court has ruled is not the case. SIEGEL: As President-elect, Trump could make news on any platform he wants. Why Twitter? SANDERS: Well, you could say that his voice on Twitter helped him win the election. This way that he always seems to tell you exactly what he's thinking at weird times, it helped him control lots of news cycles and talk directly to voters without a filter. Also, Trump tweets in this way that makes everybody cover it and that expands those tweets' reach beyond Twitter itself. Now, every president tries to bypass the media. Twitter is the newest way to do it, but Trump does something else as well. He uses Twitter to generate news, to actually make news in a way that others have not. Just think about today, two tweets from him and he runs a news cycle for 24 hours. His tweets are like some online press conferences and press releases and they are ones that he has complete control over. SIEGEL: Yeah. Some might say that he's using Twitter as a way to get around the truth, to avoid fact checking. SANDERS: Yes. And, you know, with some of these business deals that Trump has taken credit for and claimed that he did to save or create U.S. jobs, there was the one with Carrier in Indiana, Lincoln in Kentucky, another with a Japanese businessman. Trump brags about these deals, but over time as more details come out, the deals don't look as good as Trump said at first. So his tweets are sometimes not the full story. Then there are other times where they are not backed up by evidence at all, and that means to report on these things is going to require a new level of fact checking and skepticism. SIEGEL: But what do you think, Sam, does Trump change his Twitter strategy once he's president? SANDERS: He might have to. You know, the smartphone that a president uses is not like yours or mine. They are very stripped down for security reasons. Here's Barack Obama describing his smartphone on NBC's "Tonight Show" this past June. BARACK OBAMA: This is a great phone, state of the art but it doesn't take pictures. You can't text. The phone doesn't work. OBAMA: You know, you can't play your music on it. So basically it's like, does your 3-year-old have one of those play phones? SANDERS: I talked to a few cybersecurity experts about what kind of smartphone Trump might get once he's president. Everyone agreed that the official smartphone for Trump as president should not have the Twitter app on it because that app is just not secure enough. One expert, Martin Alderson, he said that what Trump should do is have an aide write his tweets for him from a secured laptop or desktop computer. Now, that could mean fewer tweets from Trump. I talked to someone else, Tom Pageler, he's a cyber expert and former Secret Service agent. He said that Trump could actually just choose to have more than one smartphone. TOM PAGELER: The president is still a person and can bring their own property, their own devices and there'll be recommendations from security leaders and advisers. However, the president can do what they want. SANDERS: He'll have the trump card. Trump will do what he wants to do and I would wager that he keeps on tweeting. SIEGEL: OK, that's NPR's Sam Sanders. Thanks. SANDERS: Thank you. Transcript provided by NPR, Copyright NPR.